Headlines fill the news about the staggering number of people with mental illnesses cycling through our nation’s jails and prisons. More than two million people with serious mental illnesses enter U.S. jails each year—more than the number of people found in the nation’s psychiatric hospitals. The related costs to law enforcement agencies and jails and the toll on human lives have reached crisis levels. This comes as no surprise to law enforcement leaders, dispatchers, and special-response units, who for decades have said that calls for service involving people with mental illnesses are among the most complex they encounter, are often conducted with limited supports for officers, and frequently involve the same individuals over and over again. These encounters also take officers out of service for long periods of time to resolve and, too often, result in tragic outcomes. With few alternatives and scarce mental health treatment resources in many communities, officers often feel they have no choice but to arrest a person having a mental health crisis who is involved in a call for service and take him or her to jail, where some level of treatment services will be provided. People with mental illnesses tend to stay in jail longer than people without mental illnesses, and they’re also more likely to return to jail. Jails spend two to three times more on people with mental illnesses, and yet this investment hasn’t translated to increased public safety or advances in longer-term recovery. With funding from the COPS Office, the Major County Sheriffs Association conducted a survey of its members to help identify agencies that are successfully addressing issues related to the large numbers of individuals with mental illnesses in jails. Although the survey’s primary purpose was to find agencies that are using promising practices in areas such as alternatives to arrest, mental health screening, assessment, data collection, and jail diversion and reentry responses, the results underscore the need to better support officers, jail staff and administrators, and other criminal justice professionals. Most survey respondents say the prevalence of people with mental illnesses in their jails has increased in the last two years, although precisely quantifying the problem is difficult. The majority of these large-county sheriffs also note they have some type of specialized program that identifies and assists individuals with mental health needs. 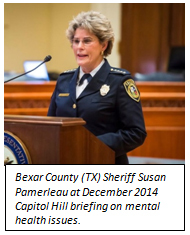 Among the supports, services, and programs that sheriffs feel are most important are mental health evaluation services in the community and in custody; 24/7 drop-off centers; training programs for officers and deputies and jail staff; and re-entry services tailored to individuals with mental illnesses—the supports often lacking in their counties and typically even further out of reach in many smaller or rural counties. Although all responding sheriffs’ agencies reported that they screen for mental illnesses and co-occurring substance use disorders, there seems to be variation in how and when such screening is conducted. It is increasingly clear from the national dialogue around these issues that although law enforcement and jail personnel have a critical role in addressing the needs of people with mental illnesses and a deep desire to effect change, they cannot do it alone. There has been a tendency to focus on individual criminal justice and behavioral health programs that reach a relatively small number of those in need or to provide a minimal level of training which, though important, are not enough to reach a tipping point in communities across the country. Change needs to happen at the systems level in both criminal justice and mental health agencies. We need to develop comprehensive plans that avoid fragmented responses to the problem, make the most effective use of resources, and take evidence-based practices and programs to scale. A new national initiative, Stepping Up—supported by U.S. Department of Justice’s (DOJ) Bureau of Justice Assistance (BJA) and led by the National Association of Counties, the Council of State Governments Justice Center, and the American Psychiatric Association Foundation—is taking just such an approach. Stepping Up unites county leaders, state and local policymakers, criminal justice and behavioral health professionals, people with mental illnesses, and other stakeholders in a single goal: to safely reduce the number of people with mental illnesses in the nation’s jails. Law enforcement and jail personnel at all levels are essential players in this initiative. It is truly community policing in action. Convene or draw on a diverse team of leaders and decision makers from multiple agencies committed to reducing the prevalence of people with mental illnesses in jails. Identify and assess the mental health needs and recidivism risk factors for adults entering jails to measure prevalence rates and guide decision making at the system, program, and case levels. Examine treatment and service capacity to determine which programs and services are available in the county for people with mental illnesses and co-occurring substance use disorders and identify barriers to change. Develop a plan with measurable outcomes that draws on comprehensive jail data and an inventory of available treatment and service options. Track progress using data and information systems. Stepping Up resources are provided to participants for conducting each of the six steps as well as for focusing on a particular discipline’s approaches such as law enforcement strategies. Among the programs promoted byStepping Up are specialized training for law enforcement and corrections, jail diversion and re-entry, and universal screening and assessments to guide decision making. The initiative also shares stories that highlight promising strategies for addressing challenges from law enforcement and corrections agencies across the country. Despite the tremendous strides made by many jurisdictions, there are an even greater number of law enforcement agencies and jails that are struggling to direct resources in ways that will improve officer and citizen safety while upholding community policing principles. Success depends on all criminal justice and behavioral health agencies coming together to align policies, procedures, and investments with proven strategies. 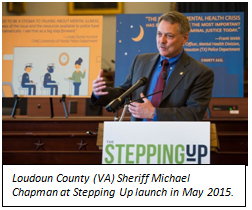 The Major County Sheriffs’ Association and the National Sheriffs’ Association (which passed a resolution supporting Stepping Up) have beenkey partners in this work. They have encouraged law enforcement agencies of all sizes to work with their county leaders to pass resolutions committing to the initiative’s six-step planning process. Stepping Up is helping to build an unprecedented national groundswell for bringing about change in which law enforcement and jail professionals can play a pivotal role. It also addresses the action item in the final report of the President’s Task Force on 21st Century Policing, which states, “Law enforcement agencies should engage in multidisciplinary, community team approaches for planning, implementing, and responding to crisis situations with complex causal factors.” That report also calls on peace officer standards and training agencies (POSTs) to make crisis intervention training a part of both basic recruit and in-service officer training and calls on Congress to appropriate funds to help support that training. These are all actions being promoted through Stepping Upand fully supported by sheriffs. The time for change is now. Through BJA’s Justice and Mental Health Collaboration Program funding for law enforcement training, learning sites, and resource development—and through other significant work being done in the field—there is a range of research-based policies and practices from which local leaders can draw. These advances are complemented by new opportunities to expand community capacity for behavioral health services. For example, with passage of the Mental Health Parity and Addiction Equity Act of 2008, more individuals have access to treatment for mental and substance use disorders in a less restrictive setting. And many states and counties, regardless of whether they are expanding Medicaid under the Patient Protection and Affordable Care Act (ACA), are considering overhauls of their health care systems, including mental health. Partnerships are critically important in community policing and essential for keeping out of jail people with mental illness who don’t need to be there. If your agency or jurisdiction is using a community policing approach to address the number of people with mental illnesses in your jails, share your stories through[email protected].